Daniel Mills' first novel is a remarkable debut. Set on what was the wild frontier of New England in August and October 1689, the story concerns Cold Marsh, a small community of Puritans under the sway of Isaiah Bellringer, a fanatical 'hell-fire and damnation' preacher. Bellringer is growing old, but his sway over the colony remains strong. His chosen successor is Edwin, an intelligent young man betrothed to the lovely Ruth. Scenes in which the couple go courting through the village - being careful to walk four feet apart - are telling. This is a society in which any physical contact between the sexes provides the Devil with an opportunity to instigate lustful deeds. 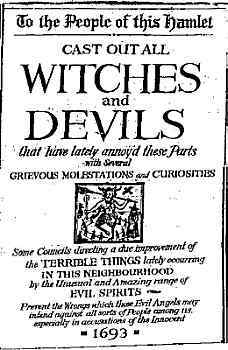 When the novel begins he Devil is also believed to be more active than usual around Cold Marsh - two young women have recently disappeared. One has been found dead from no obvious cause. The other has seemingly vanished forever. It is the villagers' response to the third disappearance that forms the central part of the novel, when three parties of men set out to search the wilderness to the north and west. Each party finds evidence not of a Satanic abduction, but of their community's own bleak heritage and even bleaker destiny. The Devil is the one character who never quite appears, but is always just offstage. Daniel Mills brilliantly evokes the way in which supposedly rational adults can be absolutely possessed by the notion of personal evil, fixated on the need to obey God's will, and yet still behave - individually and socially - in vile ways. Nathaniel Hawthorne is the great (acknowledged) influence, and an extract from 'The Minister's Black Veil' serves as a preface. In the case of Cold Marsh, collective guilt lies heavy on the older generation because a pre-emptive attack launched on a peaceful native village years before. Parallels with modern American foreign policy are there if you want to see them. The guilt lies especially heavy on William, Edwin's father, an old Roundhead officer who led the onslaught proscribed by Bellringer. William is perhaps the most 'modern' character in the novel. But I surprised to find that, while to know all is not to forgive all, it can take you a lot of the way. Even Bellringer - the village's dark Calvinist heart - is not unsympathetic. I won't give away too much of the plot. Suffice to say that all the various ingredients of New England Puritanism - lust, violence, superstition, piety and madness - converge to produce some sense of closure. If you're looking for a truly happy ending, look elsewhere. This is not a conventional horror novel, or a conventional historical novel for that matter. But it is a powerful story, remarkably well told, and makes for a compelling read on a cold winter's evening. Oh, and it is a ghost story. If Daniel Mills is reading this, are copies available yet? I had it pre-ordered on Amazon.co.uk but they show it as delayed.